NEW YORK, NY--(Marketwired - Apr 10, 2013) - Since their recent appearances on prime and daytime TV last month, running alongside a bevy of licensing and advertising syncs, and a successful run at both South by Southwest and ULTRA Music Festival, the Swedish pop-duo Icona Pop have officially been RIAA certified GOLD in the United States with their infectious single 'I Love It' ft Charli XCX. The single jumped an impressive +47% in sales last week alone, landing the #8 spot on iTunes Singles Chart and currently maintaining the #1 spot on the iTunes Dance Chart. The track continues to hook the nation with 135 adds to pop radio and 4 more to hot A/C. After successful stints on the road in late 2012 and early 2013, the ladies have continued to keep the U.S. dancing with their powerful and edgy pop music. As they embark on the North American festival circuit this summer with appearances confirmed at The Governor's Ball in NYC and Lollapalooza in Chicago (amongst others), Aino Jawo and Caroline Hjelt have zero intentions of slowing down anytime soon. Their Iconic EP remains a permanent fixture on various North American charts, with their lead single 'I Love It' ft. Charli XCX currently sitting at #24 on the Billboard Hot 100, and ranking #1 on Billboard's Dance/Electronic Chart, #9 on Billboard's Digital Songs Chart and #4 on Beatport's Top 100 Pop-Rock Tracks Chart. 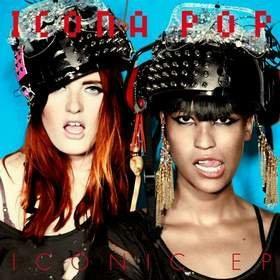 Icona Pop's debut album is tipped for release later this year. Iconic EP is available on iTunes, Amazon and Spotify.